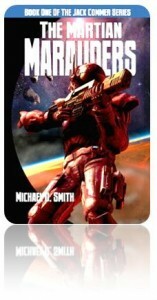 I read the first Jack Commer (Martian Marauders) and was looking forward to this book. I was not disappointed. If, and I hope there is another book, I will be in line to buy it. This book is touching in parts, and a witty space adventure, Jack facing a peace mission with his new wife, in his new position, Supreme Commander of the USSF, the latter of which he did not want. I needn’t recap the blurb or inadvertently give away a plot point. Suffice to say, read the series. Collapse and Delusion, Book Four in the Jack Commer Series, starts off innocently enough, at a wedding where we get re-acquainted with the characters in the series. 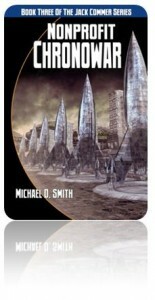 The author does a good job including refreshers about events in the previous books without big info dumps, thus setting the stage for a swift and nasty decline into scifi mayhem, including hostile aliens, dastardly plots, cool weaponry, and interesting, fleshed-out interpretations of things like time travel and programmed consciousness. 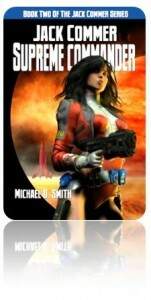 In contrast to the technical aspects of this story are a group of colorful, entertaining characters: commanders, engineers, badass women, sleazy journalists and politicians, and the redoubtable Alpha Centaurians, an alien warrior race with unsettling characteristics, pissed off attitudes and hidden agendas. These characters clash against a backdrop of a series of programmed time-space shifts and the utter collapse of the vast, Alpha Centaurian empire, in which every citizen is part of a collective mind. 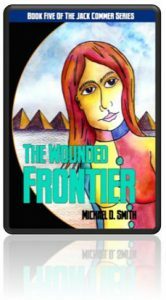 Things get ugly when Supreme Commander Jack Commer and his wife Amav journey to meet their son, who was abducted as an infant by the Alpha Centaurians. Now a recalcitrant young adult who was raised by the enemy as part of a warriors’ brotherhood, he has written a novel, popular across the cosmos—but is not what it seems. During this stressful visit, in which they’ve planned a reunion party with their friends and colleagues, the Commers are pulled into a war for control over the shattered Alpha Centaurian empire, a battle that involves an unlikely bunch of would-be overlords. In the resulting chaos, everyone scrambles to take sides between collective bliss and perfection—and the scarier choice of individuality and free will. Just when it seems there’s no good place things can go, a twist involving the surprising transformation of a tormented protagonist makes for a satisfying ending. Early in this fourth entry in the Jack Commer series, someone is asked how he manages to understand what is going on. His answer is that he simply accepts the chaos and believes everything will turn out all right as predicted. One is reminded of the poem by Rudyard Kipling: “If you can keep your head when all about you Are losing theirs and blaming it on you…” for indeed there’s a lot of blame being tossed around in this story, and a lot of panic as well. Most of it surrounds Phil Sperry, for this is Sperry’s novel first and foremost. He’s the main character this time around, and finally gets to prove exactly what kind of man he is. The title Collapse and Delusion is most appropriate, for delusion is its byword and also describes a good portion of the plot…but it’s a delightful delusion, filled with wild humor. One might compare it to The Three Stooges in Space, or It’s a Mad, Mad, Mad, Mad World…I mean, Universe. This is easy to say but more difficult to prove without going into a summary of the plot, which is definitely a difficult task. Suffice it to say somewhere within all the fun is the defeat of the Centaureans by the USSF, in a way that’s clever, unique, and totally laughable…so no spoiler there. I urge everyone to read this funny…yes, confusing and delusional…but satiric literary madness for yourself and enjoy. Afterward, recommend it to a friend…but don’t try to give him a synopsis. That’ll spoil the pleasure of his own discovery of Michael D. Smith’s series. There are a couple of new characters and plenty of old ones. Indeed, the first chapters are a bit like a disorganized family reunion in which most of the members have a grudge against each other but within a few minutes are all friends again. It’s a hoot, a blast, bitingly satiric, and funny as all get-out. I highly recommend not only this entry, but the entire series. After the collapse of the Grid, the vast collective mind of the Alpha Centaurians, humans and Martians in the United System Space Force now find themselves included in a new Grid, one they are told is completely voluntary, but who believes that? This book begins with Jack Commer and his crew embroiled in the nasty climate of resistance and hostility that accompanies widespread change. Called out for their dark histories, vilified and threatened by haters and the establishment, the crew escapes with their lives as they attempt to embark on an important mission to investigate an anomaly in a distant but familiar star system. 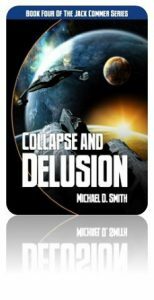 Following is the sort of mayhem at which this author excels: bickering, confusion, shock as everything that can go wrong, does, complete with crashing, exploding and vanishing ships, domestic disputes, and questionable solutions, all hanging under the shadow of a vast, unassailable sphere that no one understands. Add in a couple of ancient but expertly retrofitted human robots in the form of Draka Sortie, the suspiciously appointed President of the United System Council; and Jack’s most talented engineer, Laurie Lachrer, and things get even worse, bringing to bear the author’s penchant for smug, obnoxious villains you love to hate. These books have a great, campy 70s scifi vibe — but without the cheesy special effects: the high tech is well done, sophisticated and interesting. The robots do an alarming amount of damage before the crew figures out what’s going on, and by then it’s too late. Now under the control of an alien race called the Wounded that devours star systems for the energy rush, our heroes must find a way to outsmart the Wounded’s robotic henchmen before the demise of both the Sol and Alpha Centaurian star systems. The conclusion, characteristically wild and unexpected, involves some fallen companions and a mythical dimension where space warriors go after death, no less, making for yet another fun read. After the explosion of the Xon bomb, World War IV has rendered the planet uninhabitable. Jack Commer and the crew of the Typhoon I have been chosen to spearhead the evacuation of Earth’s surviving population to Mars. To hasten their mission: a radioactive ray has caused a crack in the Earth’s crust and the planet will explode in a few days. Sounds like a SYFY Channel disaster movie, but it’s actually a tale concocted from an 11-year-old’s imagination. 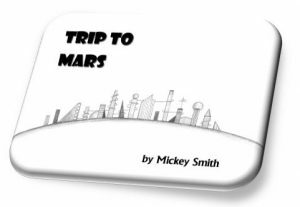 Young Mickey Smith wrote and illustrated this story when he was in the 6th grade. Many years later, his adult self took the gist of the plot and made it into the Jack Commer scifi series. Having read both Mickey’s version as well as that of the grown-up author’s, I was amazed by the depth and detail that 11-year-old put into his story. One can sense that here is a budding author in the making…and one would be correct. The story shows a surprising grasp of drama, tension, and adventure which will be reflected in later works. The illustrations also show a very good grasp of artistic technique. I recommend A Trip to Mars for both youngsters and adults alike. This graphic novel was supplied by the author and no remuneration was involved in the writing of this review.